The financial forecast is a key input to strategic planning, a firm’s process of defining strategy and making decisions about allocating resources. Using historical internal accounting and sales data, in addition to external market and economic indicators, a financial forecast is an economist’s best guess of what will happen to a company in financial terms over a given time period, which is usually one year. financial modeling: the task of building an abstract representation (a model) of a financial decision making situation. Strategic planning is an organization’s process of defining its strategy, or direction, and making decisions about allocating resources to pursue this strategy. In order to determine the direction of the organization, it is necessary to understand its current position and the possible avenues through which it can pursue a particular course of action. A financial forecast is an estimate of future financial outcomes for a company. Using historical internal accounting and sales data, in addition to external market and economic indicators, a financial forecast is an economist’s best guess of what will happen to a company in financial terms over a given time period—which is usually one year. Often, the forecaster’s own assumptions and beliefs will be used to guess future growth rates and potential events that will affect the numbers on a financial statement. Arguably, the most difficult aspect of preparing a financial forecast is predicting revenue. Future costs can be estimated by using historical accounting data; variable costs are also a function of sales. Unlike a financial plan or a budget, a financial forecast doesn’t have to be used as a planning document. Outside analysts can use a financial forecast to estimate a company’s success in the coming year. Strategic Planning: Financial forecasting is essential for a company’s strategic planning, management, and organization. Financial forecasting is often helped by processes of financial modeling. Financial modeling is the task of building an abstract representation (a model) of a financial decision making situation. This is a mathematical model designed to represent a simplified version of the performance of a financial asset or portfolio of a business, project, or any other investment. Financial modeling is a general term that means different things to different users; the reference usually relates either to accounting and corporate finance applications, or to quantitative finance applications.Typically, financial modelling is understood to mean an exercise in either asset pricing or corporate finance, of a quantitative nature. In other words, financial modelling is about translating a set of hypotheses about the behavior of markets or agents into numerical predictions; for example, a firm’s decisions about investments or investment returns. Once again, these are assumptions that will factor into the financial forecasting and planning for the corporation. Once the financial statements are forecast, one can attach a value to the firm, and see what changes need to be made to put the company in a better financial position. AFN is “additional funds needed,” and refers to the additional resources that will be needed for a company to expand its operations. liabilities: An amount of money in a company that is owed to someone and has to be paid in the future, such as tax, debt, interest, and mortgage payments. AFN stands for “additional funds needed. ” It is a concept used most commonly in business looking to expand operations and influence. Since a business that seeks to increase its sales level will require more assets to meet that goal, some provision must be made to accommodate the change in assets. To phrase it another way, the business must have some plan to actually finance the new assets that will be needed to increase sales. Assets – Economic Resources: AFN determines the extra assets and financing that will be needed for a firm to undertake a new project or expand its operations and sales. AFN is a way of calculating how much new funding will be required, so that the firm can realistically look at whether or not they will be able to generate the additional funding and therefore be able to achieve the higher sales level. Determining the amount of external funding needed is a key part of calculating AFN. This can be determined by mathematical formulas which use inputs that can be found in a company’s financial statements. capacity: The maximum that can be produced on a machine or in a facility or group. Adjusting capacity takes into account the maximum level of output that can be produced by a firm, and how that can be changed in order to change the potential forecasts of a firm’s performance long term. This involves capacity planning and management that will keep a firm from growing too fast in sales and making sure it is utilizing capital in the most efficient way possible. Capacity planning is the process of determining the production capacity needed by an organization to meet changing demands for its products. In the context of capacity planning, “design capacity” is the maximum amount of work that an organization is capable of completing in a given period. “Effective capacity” is the maximum amount of work that an organization is capable of completing in a given period due to constraints such as quality problems, delays, material handling, etc. 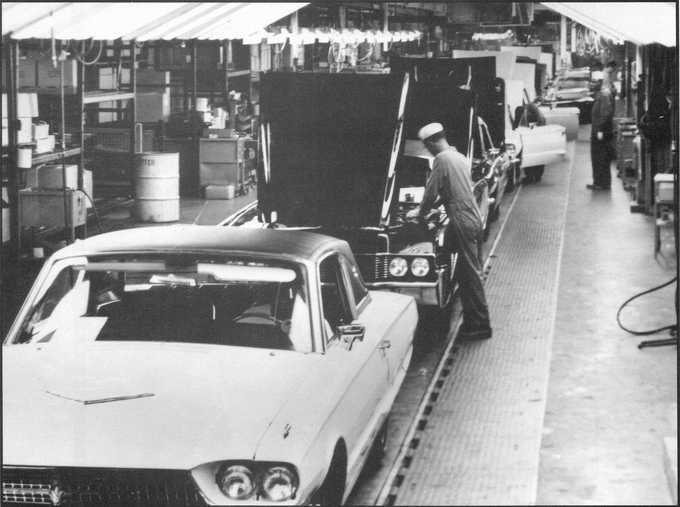 Thunderbird Assembly Line: Adjusting capacity will affect the amount of items produced on the assembly line. Capacity utilization is a concept in economics and managerial accounting that refers to the extent to which an enterprise or a nation actually uses its installed productive capacity. Therefore, it refers to the relationship between actual output that ‘is’ produced with the installed equipment and the potential output which ‘could’ be produced with it, if capacity was fully used. Implicitly, the capacity utilization rate is also an indicator of how efficiently the factors of production are being used. Much statistical and anecdotal evidence shows that many industries in the developed capitalist economies suffer from chronic excess capacity. Therefore, critics of market capitalism argue the system is not as efficient as it may seem, since at least 1/5 more output could be produced and sold, if buying power was better distributed. However, a level of utilization somewhat below the maximum prevails, regardless of economic conditions. As a result, we look into capacity utilization to forecast a firm’s success and growth numbers when predicting how financial statements will look into the future. The decision makers at the firm will be able to adjust this capacity in order to grow the firm in a way they feel is optimal.